One of the finalists of the 2006 Michelin Design Awards was Viktor Tivadar Sass, a 27-year-old who is currently pursuing a product design degree at the Hungarian University of Craftarts and Design in Budapest, Hungary. He has gained work experience at Invictus Games Ltd. where he helped produced computer games. Tivadar has received numerous design awards including the first place prize four times in the Camion Truck and Bus Magazine International Design Competition. He also has finished first in the 2003 Hungarian Car Design Competition and the 2003 Motor Trend International Design Contest. Besides being selected as a finalist in the 2006 Michelin Challenge Design, this year he also finished second in the Audi, Hungarian Design Contest. "The rear end has a similar feeling as the Murciélago. The new features are the simple shaped exhaust-pipe and the unique bumpers," says Tivadar. 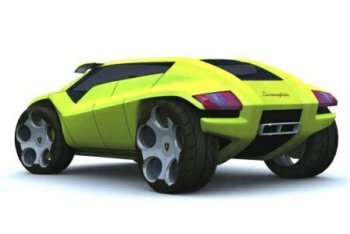 One of the finalists of the 2006 Michelin Design Awards was Viktor Tivadar Sass, a Hungarian design student who offered his interpretation of a future sporty Lamborghini off-roader that draws from the brand's design values. 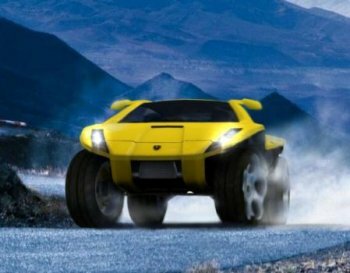 "My concept was not to design a car like a Lamborghini LM, but to design a sporty-off-roader for young people who like the extremities, and for celebrities too," says Tivadar. "I intended it for a loyal companion of all adventurers in every respect. I used the formal language of Murciélago and Gallardo to keep values of Lamborghini design. It would be a real characteristic and exclusive vehicle above today's hobby-over lands. "The basic character of my car is the sportscar silhouette which splits the car's body. 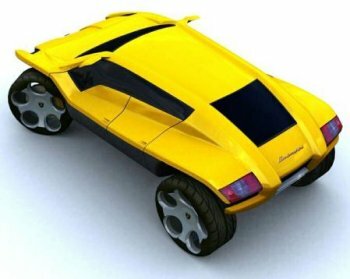 The top painted part is a super-sportscar; the bottom is the off-road side of the car. The off-road surface is covered with rubber. The wheels are the main design feature of the car. These are large and have an irregular shape. It has a well known five holed Lamborghini-style rim, but the holes dip into the rubber. "The car from the front looks like a quad because it has high kept fenders and visible, massive suspension parts. The rear end has a similar feeling as the Murciélago. The new features are the simple shaped exhaust-pipe and the unique bumpers," he concludes.